In Lebanon, the March 25 Marian solemnity of the Annunciation of the Lord has been recognized a national holiday since 2010. 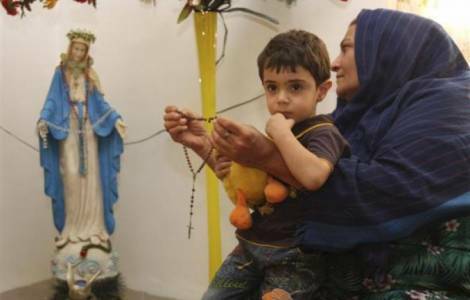 Even today, in various Lebanese churches and sanctuaries, Christians and Muslims will together experience acts of veneration for the Virgin Maria, reported Fides News Agency. Sunni Sheikh Mohamad Nokkari, who teaches in the faculty of law in Beirut, Dubai, and Strasbourg, wanted to further national reconciliation and inter-communal friendship, by raising the profile of the Virgin Mary, who is a point of reference for both Christians and Muslims. During a trip to Lebanon organized thanks to Opera Romana Pellegrinaggi, Sheikh Noccari told Fides-: “My wife and I, who is French, had a statue of the Virgin Mary at home and there was a relative who every time he came to visit us would insult her, hid her in the bathroom, and once he broke the statue in two. I bought another one, made of heavy metal so that it could no longer be damaged”. In the beginning, the idea was to make the Islamic-Christian celebration of Mary coincide with the feast of the Immaculate, but then the idea changed because it was important to bear in mind that Orthodox Christians have not defined the dogma of the Immaculate Conception of Mary. The choice of the date to celebrate Mary by Christians and Muslims fell on the feast of the Annunciation. The Annunciation of the Angel to Mary is narrated both in the Gospel and in the Koran. Mary is the only woman mentioned by name in the Koran 34 times (while Mary’s name appears in the Gospels 19 times).